Home / Astronomy / Astrophysics / VY Canis Majoris - Some Big Things In The Universe. 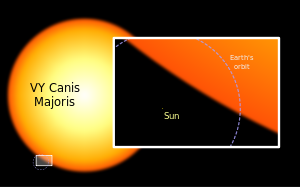 VY Canis Majoris - Some Big Things In The Universe. Let’s talk a little for a moment about sizes. Do you think the pyramids are big? How about Sears Tower? Both are nothing compared to Mt. Everest. They’re all huge in every respect, mainly when you look at them from a human or ‘earthly’ perspective. These objects however, are microscopic when compared to some of the things that exist in our universe. Let’s explore them. We’re going to talk about big things. No, not your tummy, we’re talking about all those large and dominant things in the Universe that almost defy description. Stars, galaxies, black holes and the like. Hang on, this is going to be quite a ride. Let’s start with raw power. Astronomers have recently witnessed what they thought was the impossible, the most powerful explosion in the universe. Think about how much energy our sun puts out every day, then think about how much it would put out over its entire lifetime. That’s a pretty big figure, right? Now, imagine if all that raw power was released in just a few seconds, what sort of explosion would you see? 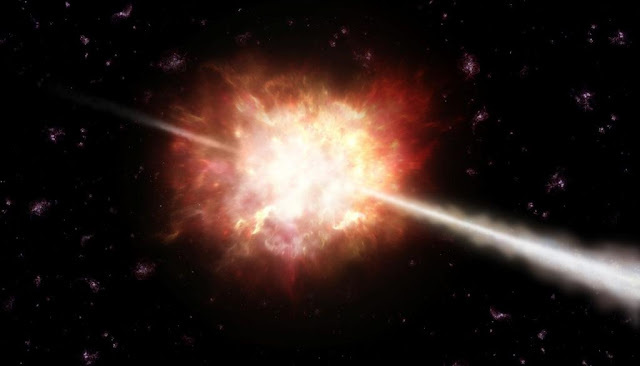 You would see something astronomers call a ‘gamma ray burst’ – the death of a giant star. For a fraction of a second, less time than it takes to blink your eye, it became the largest explosion ever witnessed in the universe, releasing as much energy as our sun has in all recorded history! For a few moments, this object had a million times the luminosity of the entire Milky Way Galaxy! Incredibly, the dying star was 7.5 billion light years away, halfway across the visible universe! A light year is 10 trillion kilometres. Ceres is the largest asteroid we know of. It’s really a ‘Dwarf Planet’ almost 1,000 kilometres in diameter which makes it as large as California in the USA. It’s so big that it contains 25% of the mass of the entire asteroid belt. If you took all the asteroids in the asteroid belt and glued them together, that new object would only be about 2.5 times as big as Ceres. VY Canis Majoris is the largest star that we know of. It’s in a class of star known as Red Hyper Giants. It’s 2,000 times wider than the sun and would take the world’s fastest race car 2,600 years to circle it once. If you replaced our Sun with VY Canis Majoris, its radius would extend out passed Saturn. The largest galaxy that we’ve discovered so far is arguably the IC1101 super galaxy. It is 6 million light years across. Compare that to the Milky Way which is a mere 100 thousand light years across. IC1101 is a staggering 60 times larger than our own. What do you think is the largest planet? Jupiter you might say but you’d be badly wrong. Located in the constellation Hercules, a planet called TRES4 holds the title of the largest planet we’ve discovered so far. It is 70% larger than Jupiter in diameter but astronomers think they may have discovered an even bigger one! Now all this stuff is a long way off but what about something well known you can see from Australia? OK, try this. Before sunrise go out and find the ‘Saucepan’ or Orion. See that red star below the base of the saucepan? It’s a close super giant called called Betelguese with a radius 936 times larger than our own Sun.